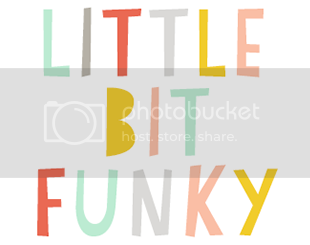 Little Bit Funky: "lego review AKA tamer of the wildchild and $100 LEGO gift card, too!" 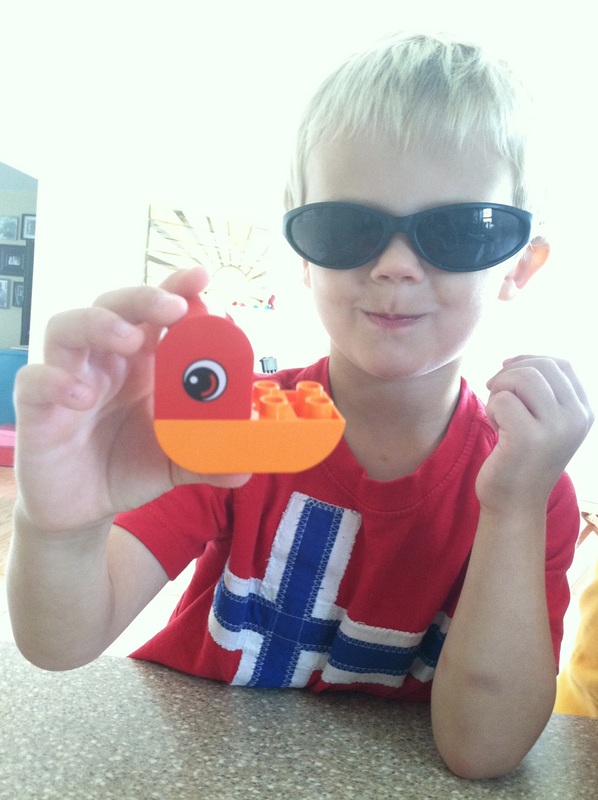 "lego review AKA tamer of the wildchild and $100 LEGO gift card, too!" Recently LEGO DUPLO asked if my boys and I would review their new "Read & Build" sets. Ummm, yes! LEGOs are huge in my house and very few other toys will tame my wild animals into quiet play. We have a lot of experience with LEGOs but the boys were definitely intrigued by the whole book aspect to the sets. Each set comes with a book and a set of blocks to coordinate with the story line. This reviewer, who asked us to keep his identity hidden, enjoyed searching for the pieces as we needed them. The book is set up to read a page and then build the creatures in the storyline. Aaron sat still for the WHOLE book. He did not ask for snacks or a show or what came next. He focused on the task at hand. He carefully (and QUIETLY) searched through the pile until he found the ones laid out on the page. He was able to build each one on his own. Each building section has a photo of the bricks they are looking for...Aaron enjoyed the match up part of this as well. He took the time to find each one first and then built each little critter just as shown. He worked hard and took his job very seriously. The only part I had to do was read. The whole set up makes it very easy to play along with your child, interact, talk about colors, words and otherwise involve them more in the storyline. I even found him later doing it on his own by "reading the story" and making the critters all on his own. Overall, they were a hit! 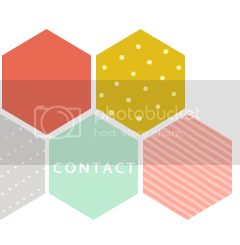 And we will be looking for more sets for birthdays and Christmas. Anything that encourages my boys to slow down, pay attention and learn a little is a good find by me. Want to get some of your own? 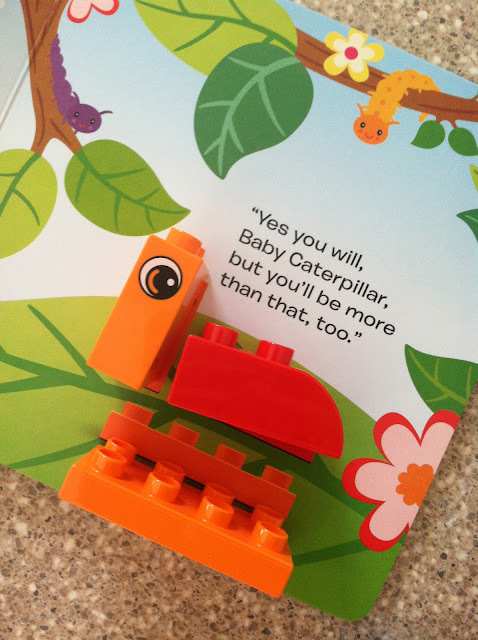 BlogHer is offering up a $100 LEGO gift card to one luck reader...just answer the question “How do you think Books and Bricks will help your child learn to read?” in the comment section below. This sweepstakes runs from 7/11 – 8/19/12. I can see my boys enjoying the hands on aspect of these blocks and books. Sometimes they tend to wander durring story time so I can see the blocks helping me to keep them seated while I read and they play. I would love to gift these books and bricks to my three-year old nephew who loves to sound out words and work with his hands. 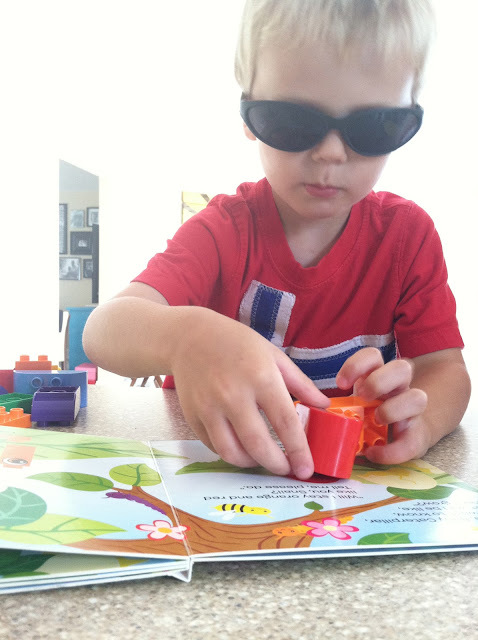 Using both of these skills together will help him learn to read quicker while fine tuning his motor skills. Great product! 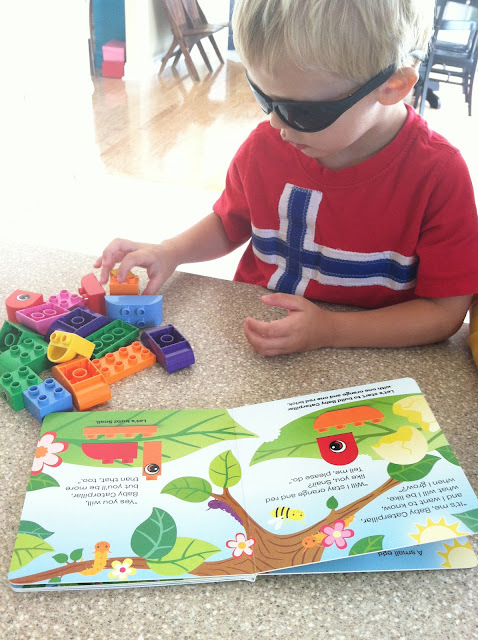 I think the Lego Books with Bricks could keep my child interested in looking at a page for more than 2 seconds--a must for learning to read! =) I'd love to win this gift card--all my kids are totally into legos!!! We are huge Duplo fans in our house. I love that the books make them slow down and pay close attention to both pictures and words. I love that LEGO added the element of play to reading - definitely helps keep boys interested. So smart! My boys are avid Lego enthusiasts! Having a storyline to build as they read is genius! Taking time to really pay attention to the details they are reading will help them with all the comprehension testing that goes on in their classrooms! Such a great idea Lego, well done! What a great concept! When my nephew gets older, this is something we can get for him. These are too cute! I'd think they'd get my son reading to try something new. He loves to recreate the story afterwards. I have not heard of these but I think my little one would love them. Just beaing able to keep him still and focused on the book for that long will help in learning to read. He will definitely want to do it all by himself! First of all, those sets sound really neat! There's a lot of learning that can be accomplished. I will have to check those out! I love that Lego has once again demonstrated their awesomeness encouraging young minds to learn & create! I wish this product was available when my now 13 year old lego master designer was learning to read! Fantastic! Anything that will make them focus long enough to look at a page with words if going to help them read. OUr little kiddos love legos...and they love books. Put them together and that is a dynamic duo! I think these would be wonderful for my three-year-old... it seems that your Aaron and my Ethan have a lot in common! Hopefully this would get him to actually sit still and focus! My 5 year old would love these! He's going into kindergarten this year. Fun and reading in one! Win! My guy is a little too old for these but he LOVES legos! We could do some serious damage with that $100 card! My two-year old loves Legos. These books will be a great tool as he learns to read. He'll be impressed with a book about Legos! This ia awesome! I have looking for ways to motivate my reluctant reader and I think this will do it. She loves to "help" her sister build with legos, so I know this will be a hit. I would have loved these when my son was younger he still does not like to read but he loved and still loves LEGOs. I am sure he would have paid attention to these books. We are HUGE Lego fans in our house and it is so nice that my youngest has finally started to spend more time building than destroying. I love seeing their imaginations come to life while building. Oh what we could do with $100 to Lego.... I would have to remind my husband that it's for the kids and not him. We would love to talk about the types of blocks we use when reading and building! 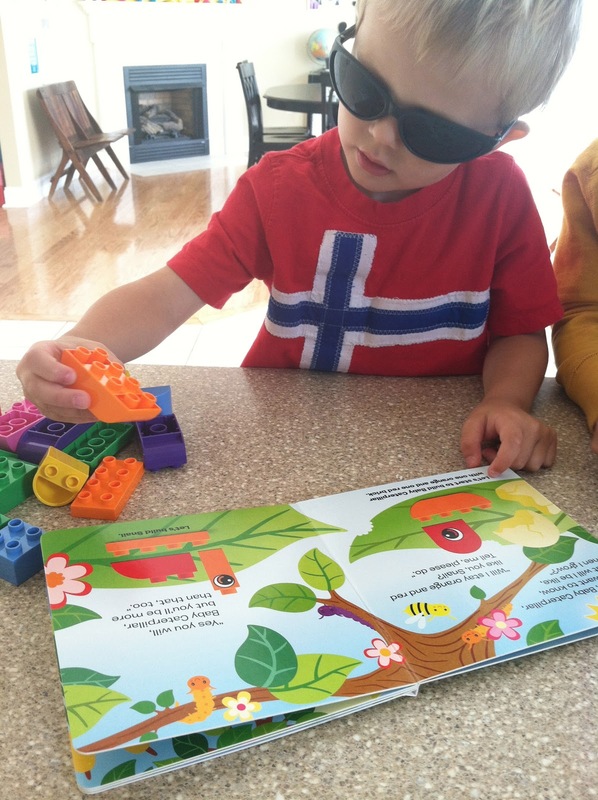 Building and reading are two of my boys' favorite activities. Putting the two together? Genius. My kids would totally love this! I know it would help my son read because it keeps him interested with the book with hands on activities. So cool. I would love this for my boy! I love this concept - the girls will sit and listen to us read, but I really think having something "to do" in addition will help them start to see the words and start connecting what's going on to the words on paper. Hands-on learning is the best! My son would love these sets! 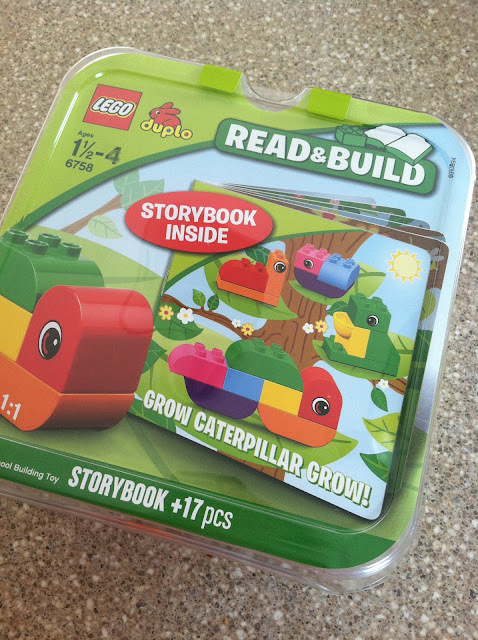 I like these these books and bricks sets are interactive such a plus to get boys to read! I seen this the other day in a magazine I can not wait to get my son all 3 of them!! I seen these in a magazine the other day and I can not wait to get my son all 3! How fun! 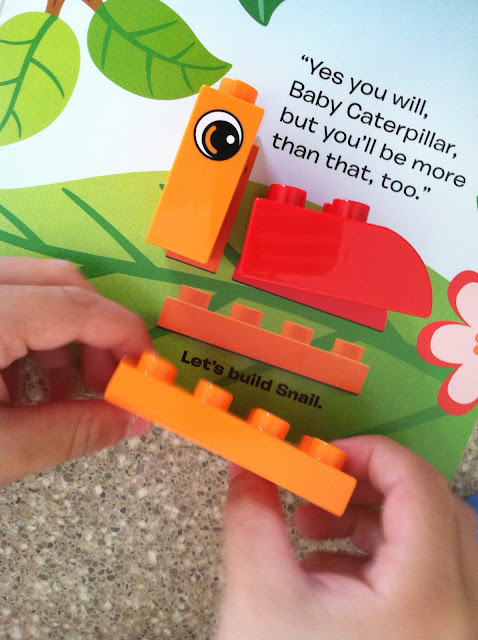 The legos will definitely get kids interested in the book or vica versa. 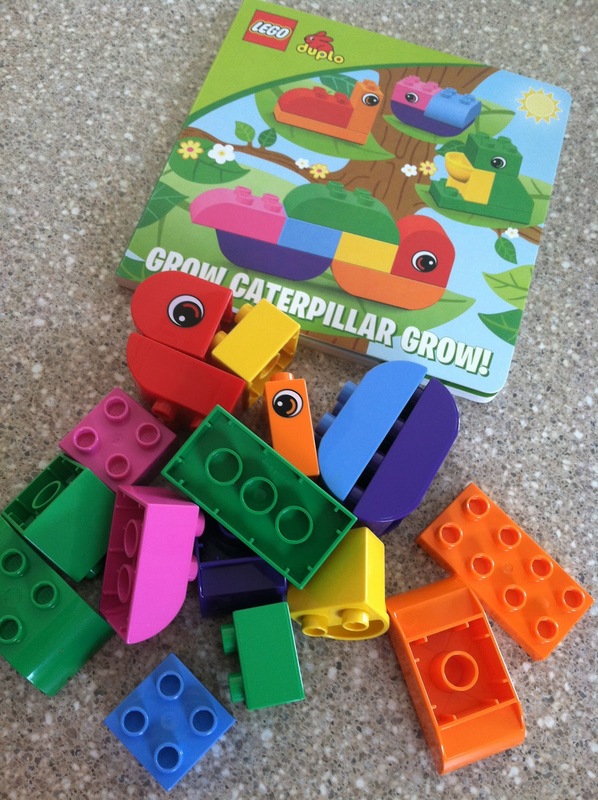 It's a fun hands-on activity and the reading serves a purpose (learning how to build the animals.) I love that they have to follow the directions in the book to figure out how to make the simple animals...a good skill to practice. I'll have to check these out the next time I'm at the store. Those are super fun! I think that it would Help my kids follow directions and follow the content of the book more closely! Legos are my boys favorite toys ever! They would love this! I think this would help my daughter pay attention to the entire story so that she could build each character. She loves her brother's Legos but is too small for them! Awesome book! My son LOVES Legos! He is 8, so too old for Duplos but the books/blocks would be great in my preschool classrooom! I love how the build instructions are laid out for the children! Read & Build will help because it's interactive. He'll love building the characters from the stories and seeing them take shape as he goes! My two boys LOVE Legos!! My sons are ages 8 and 11, so Duplos are too young for them. I teach Kindergarten, so this book would be GREAT for a center in my classroom. This would be an awesome way to encourage my reluctant readers to practice! Great product! Wow, what a great product! I think the LEGO DUPLO Read & Build will help my kids learn to read with all those fun colors block building and interaction. For sure this is a lot more fun than just reading the book. What a great way to get kids to read! Fun way to keep them connected to the story. Great idea! What a great way to connect kids to reading! Love it! Anything to get them interested in a book! I think it would be easier to make the connection between the words and the objects that they have just made. My son would love these. He loves books and building perfect gift for him. Great idea for his upcoming 3rd birthday. This would be great to slow my soon to be Kindergartener who goes 90mph all the time!! Also, his little brother can play and learn from them too!! This is wonderful! My littlest guy has a had time staying focused when reading. I think the fun hands on aspect of including Lego's, one of his favorite things, would work wonders at keeping him from wandering. My son loves this idea and has from the moment he first saw it. I would hope this would help with word recognition the more we played. this would help my 3 yo sit still longer with a book! that has to count for absorbing things, right? it helps kids learn to build on what they already know! Thanks for a super giveaway! My son and daughter have Sensory Processing Disorder. They fidget at story time w/a small toy. How great to combine the toy with the story! This would encourage fine motor skills as well as early reading. 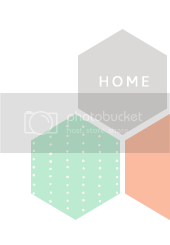 I am hoping to homeschool, and think this would be a fun tool to use! By keeping kids engaged in reading and building at the same time. I think Books and Bricks will help my child to read by encouraging the to stay engaged by building and reading together. Legs are a huge hit at my house, but my 2 year old gets bored easily so these would be awesome! Reading and hands on! 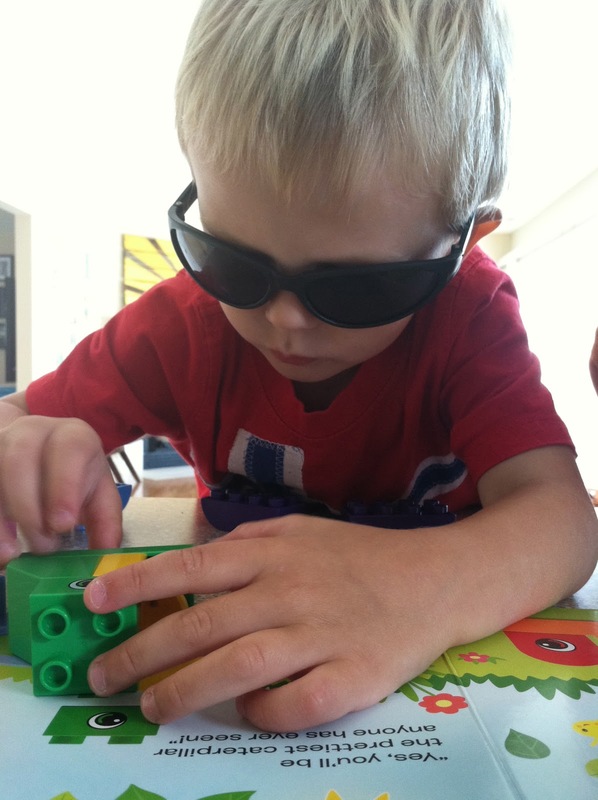 The interaction with the Legos will encourage reading. Legos has been part of my life for years as my kds played with them growing up. The sets at that time were geared towards boys. Fantastic that there are sets that will interest girls as well. Now my grand kids are into Legos. My grandson Owen is OBSESSED with them. These sets may be a bit young for him, but with a younger sibling coming along they would be just perfect! All kids want to do it " by myself" and these sets will definitely add to that independence! Legos have been part of my life fir years, first with my own kids (though at that time there wasn't sets for girls) and now with my grand kids. My grandson, Owen, is OBSESSED! At age 6 he has soooo many sets! Elise has become interested, following in her brother's footsteps, with all things princess! These new sets will be super for promoting independence through reading and we all know each child just wants to do it "by myself". With a grandchild who is 1 yr old these will make great future gifts! I think it will encourage our daughters to play pretend, something that boosts imagination skills! I think pairing legos (which are an every day thing in our house, my kids are playing with them as I type this!) and reading (another every day thing!) is great because it encourages reading, and it incorporates reading with following directions, which can help them to remember things. Great idea from lego! My girls love to play with legos I think that it would help them to read and play at the same time. I think the fact that my 3 year old can engage in the storyline along with building will encourage him! This looks like a great way to add a kinesthetic aspect to reading! Everyone can learn by listening, but add another modality and the new ideas really stick! And there's the added benefit of hooking the reading to a personal experience as a builder. Love this concept Lego! The kids already love legos so this will be very exciting to see them having fun and learning to read at the same time. Children start getting to an age where they want to do things on their own. I think encourages that independence by giving them the story and illustrations so they can build their creations all by themselves. By building as they read, they are absorbing more meaning of the words of the story and thus grasping the concept of how reading works!! Books and bricks, awesome. Paying close attention, tactical mixed with words is always important.